TRANSMISSION: 8-SPEED AUTOMATIC (845RE) (STD), TRAILHAWK LUXURY GROUP -inc: Bi-Xenon HID Headlamps, Auto High Beam Headlamp Control, Power Tilt/Telescope Steering Column, Cargo Compartment Cover, Rain Sensitive Windshield Wipers, Automatic Headlamp Leveling System, Dual-Pane Panoramic Sunroof, LED Daytime Running Headlamps, LED Fog Lamps, RUBY RED/BLACK, TRAILHAWK LEATHER TRIM SEATS W/PERF -inc: #4 Seat Foam Cushion, REAR DVD ENTERTAINMENT CENTER -inc: Blu-Ray Compatible Dual Screen Video, Rear Seat Video System, RADIO: UCONNECT 3C NAV W/8.4" DISPLAY -inc: SiriusXM Travel Link (subscription required), HD Radio, GPS Navigation, Rear View Auto Dim Mirror, Uconnect Access (subscription required), 8.4" Touchscreen Display, Roadside Assistance & 9-1-1 Call, Integrated Voice Command w/Bluetooth, SiriusXM Traffic (subscription required), QUICK ORDER PACKAGE 23J -inc: Engine: 3.6L V6 24V VVT UPG I w/ESS, Transmission: 8-Speed Automatic (845RE), MOPAR ROCK RAILS, JEEP ACTIVE SAFETY GROUP -inc: Lane Departure Warning Plus, Parallel & Perp Park Assist w/Stop, Rain Sensitive Windshield Wipers, Advanced Brake Assist, Full Speed FWD Collision Warn Plus, Adaptive Cruise Control w/Stop, GVWR: 6,500 LBS (STD), GRANITE CRYSTAL METALLIC CLEARCOAT. 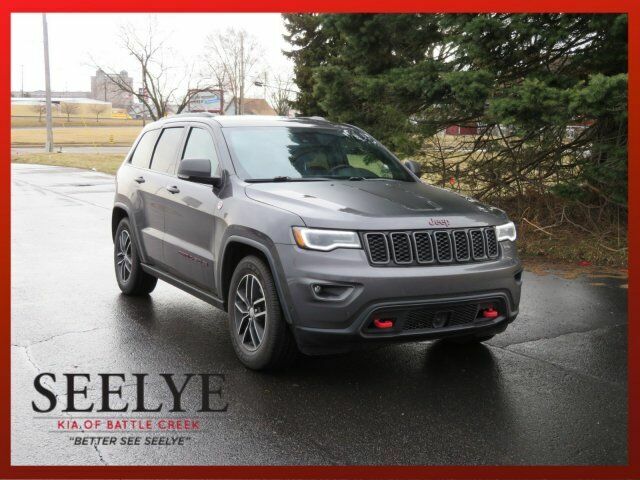 This Jeep Grand Cherokee has a strong Regular Unleaded V-6 3.6 L/220 engine powering this Automatic transmission. BLIND SPOT & CROSS PATH DETECTION -inc: Auto Dim Exterior Passenger Mirror, 3.45 REAR AXLE RATIO (STD), Wheels: 18" x 8.0" Off Road Aluminum, Voice Recorder, Valet Function, Uconnect Access Mobile Hotspot Internet Access, Uconnect Access Emergency Sos, Trip Computer, Transmission: 8-Speed Automatic (845RE), Transmission w/Driver Selectable Mode and Sequential Shift Control w/Steering Wheel Controls, Tracker System, Tires: P265/60R18 BSW AS All Terrain, Tire Specific Low Tire Pressure Warning, Tailgate/Rear Door Lock Included w/Power Door Locks, Systems Monitor, Steel Spare Wheel, Speed Sensitive Variable Intermittent Wipers, Smart Device Integration, SIRIUSXM Satellite Radio, SiriusXM Radio (subscription required).